Yes, we know they haven't tied the knot just yet — but Meghan Markle and Prince Harry are reportedly quite eager to start a family. And we are trying to behave ourselves — we really are — but we can't help but imagine little freckled mixed-race gingers frolicking with their cousins Princes George and Louis and Princess Charlotte. We move fast like that. Meghan Markle's good friend and former agent, Gina Nelthorpe-Cowne, revealed in a brand-new documentary (airing today on Sky One) that Markle eager to start a family. Be still our royal baby-loving hearts. Nelthorpe-Cowne talked about traveling with Markle for a work engagement in the Cayman Islands (not a bad gig, eh?). 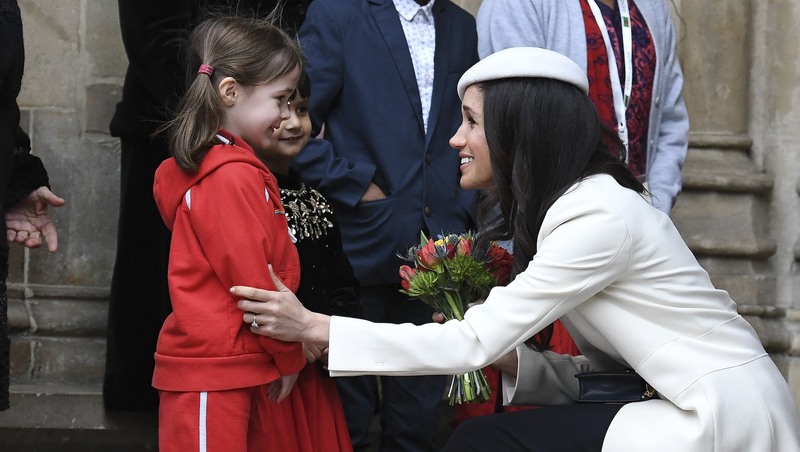 In the documentary, she discusses chatting with Markle about her dreams for the future. ''She said to me, 'I would absolutely love to have children, and I can't wait to be a mother,"' Nelthorpe-Cowne reported. Hopefully, Markle isn't too cranky with Nelthorpe-Cowne for giving away this tiny secret. Anyway, it's pretty clear that both she and Harry adore kids. They revealed to the press during their engagement interview that they had family on their mind. A smiling Harry told reporters, "One step at a time. Hopefully we’ll start a family in the near future." Yes, please, OMG. (Wait. Did we say that out loud?) And back in March, Markle met a couple in Belfast who create unique hypoallergenic baby products. Markle was enamored with their creations, and she said: "I'm sure at some point we'll need the whole [product line]." Diaper duty must be nigh indeed. Even before meeting Prince Harry, Markle discussed her personal goals in an interview with Hello — and family was a big priority. "My life is more amazing than I ever thought it could be. I also dream to have a family. It's all about balance, and I have so much happiness in my career and am fortunate to travel the world and see so many amazing things — it will also be nice to be anchored to something grounded and in the same place. Raising a family will be a wonderful part of that," she said. Anchors aweigh! Oops. We said that out loud too.